While it feels like Halloween was just yesterday, “pumpkin is out” according to Jon Plummer of Moomers Homemade Ice Cream. Traverse City’s own Moomers (yes, the one of Good Morning America fame) is gearing up for the December holiday season and welcomes you to join them. 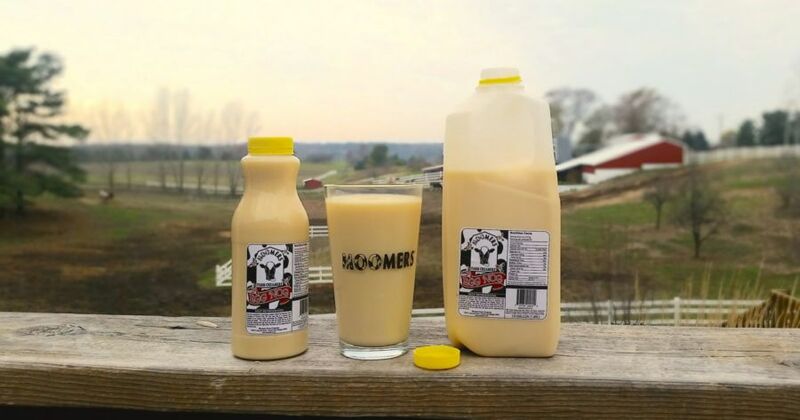 Not only is Moomers introducing new Egg Nog from their Creamery this year, they’re also bringing back their famous gingerbread houses, gingerbread boys and girls, and—get this—gingerbread cows pulling Santa’s sleigh! Guests are invited to make reservations between November 27 and December 24 for gingerbread projects that include the gingerbread base, lots of candy to decorate with, and a “Memory at Moomers” ornament displaying their creation. “At ages 6, 16, or 36, you can put the ornament on your tree and tell your family about it,” says Moomers owner, Nancy Plummer. It’s a tradition they’ve been doing for seven or eight years now. Over 500 gingerbread pieces were decorated last year by groups of families and friends, and the Plummers are anticipating even more creators this holiday season. Gingerbread house or sleigh projects cost $25 each, and gingerbread boys and girls cost $15. Reservations can be made by calling Moomers at 231-941-4122. Plus, you can already pick up Egg Nog at their Traverse City location: 7263 N. Long Lake Road. Learn more about the Northern Michigan family-owned dairy company, Moomers Homemade Ice Cream, with this MyNorth Media video by Kris Riley.